CyberGhost VPN recently launched their dedicated Amazon Fire TV Stick app. In this short review I’m taking a look at it to see how it performs and how it compares to the apps from the competition. The Amazon Fire TV and smaller Fire TV Stick have revolutionised the way many of us watch TV. Although that revolution hasn’t changed the way media is region-restricted or done anything to improve the privacy of what we’re watching. With the Amazon Fire TV and Fire TV Stick being extremely versatile such as allowing the installation of Kodi it has become more important than ever to protect your online privacy on every device. I’ve been testing CyberGhost VPN’s latest app for the devices and here are my thoughts. CyberGhost VPN’s app from the outset stands out for the quality of its interface. 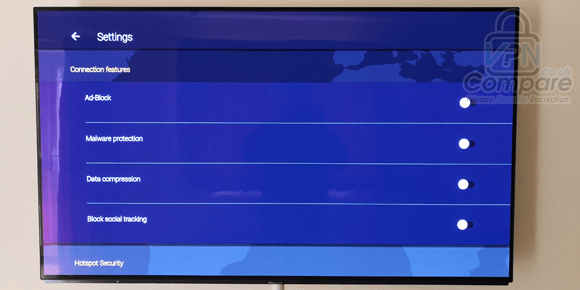 Unlike some similar apps, it appears to have been rigorously tested with both the Fire TV and Fire TV Stick to ensure the interface feels native for the devices. There are no missing corners or options that hover outside the screen. The CyberGhost VPN app for Amazon devices works extremely well in this regard. Opt-out on the left hand side. You’ll also then need to allow the app to make network connections. This is similar to the warning you’ll see when using an Android VPN and is essential you accept to allow the app to function correctly. After that, it’s simply a case of entering your username and password and set-up is complete. Navigating around the app is simple. The interface is one of the best I’ve seen for the Fire TV and Fire TV Stick which makes using CyberGhost VPN’s Amazon app quick and painless. From the main screen you’re able to either connect which comes pre-set to connect to the ‘Best Location’ or you can search through the available servers. The server selection list is categorised into well thought out sections from an ‘All Countries‘ list to the more important ‘Streaming Friendly‘ section. You can also add ‘Favourites‘ to allow you to find your most used in the future. The ‘Streaming Friendly’ section is likely where you’ll concentrate most of your time allowing you to unblock and access services like American Netflix and other region-restricted content. Use ‘Streaming Friendly’ servers to unblock content. 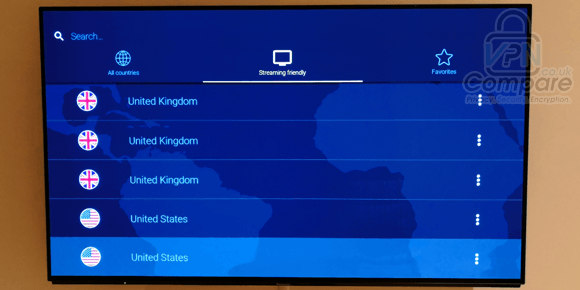 Once you’ve selected a country connection is quick which returns you to the main screen showing how long you’ve been connected, the location you’re connected to and the IP Address. The CyberGhost VPN Amazon app goes one step further than the offerings from many other providers and offers additional protection. While these will not be of major concern while you’re using an Amazon Fire TV or Fire TV Stick it does give you the option to enhance your security and it’s nice to see these additional features available. Protect yourself from malware and other nasties. As well as the enhanced security features available on the app there are some limited account information details too. This includes your subscription package, remaining subscription period and how many devices you’ve activated on the service versus how many slots are remaining. 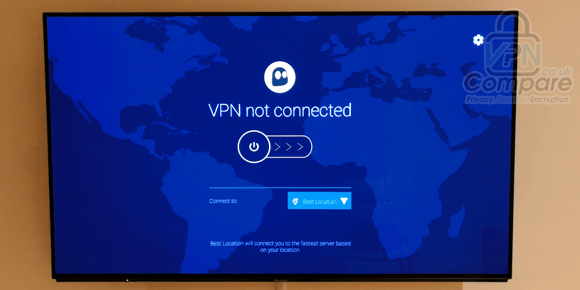 If you’re concerned about your viewing security then the app can even warn you when you connect to a new unidentified network and automatically connect to the VPN for you. This feature can also be disabled if you find it annoying. Using the CyberGhost VPN app for both Amazon Fire TV and Fire TV Stick is incredibly easy. I was impressed with the neat interface that is not only simple to navigate but also incredibly well made for the Amazon devices. Connection can be made within just a few clicks of your Amazon remote control. This will allow you to unblock content or apps either using web-browsers such as Silk Browser or Firefox or when using apps from overseas. You’ll also be able to protect the privacy of what you’re watching which is especially good if you’ve got something like Kodi installed on your Fire TV Stick. 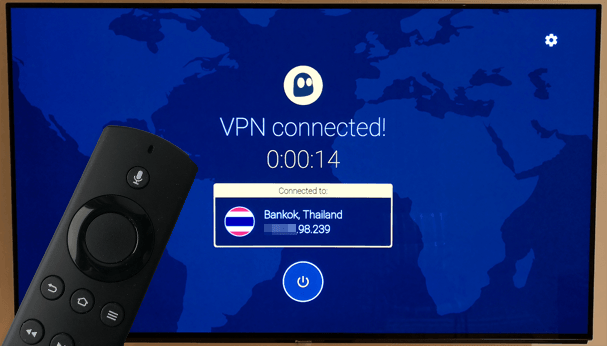 The CyberGhost VPN app is certainly one of the best Amazon Fire TV / Fire TV Stick apps I’ve seen and used and with such little choice for the devices from other providers it means CyberGhost VPN has joined an extremely exclusive club. 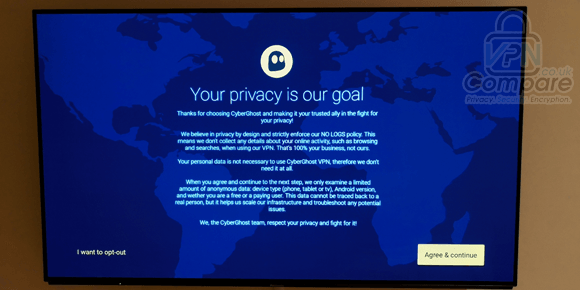 If you’re looking for a VPN for your Amazon Fire TV or Fire TV Stick then I can highly recommend the CyberGhost VPN one. Have you used the CyberGhost VPN Fire TV Stick app? If so I would love to know what you thought. Why not post your feedback in the comments section below?